L'intervento più emozionante al giuramento del secondo mandato di Barack Obama è stato forse quello di Beyoncé che ha cantato il National Anthem. Voce da brivido, e che scalda il cuore. Per il resto, il Presidentissimo ha elencato gli obiettivi dei suoi "ancora 4 anni" e tra questi ci sono stati sicuramente molti elementi di rilievo, a partire dai pari diritti dei gay, l'accento posto sul cambiamento climatico (finalmente! ), la grande attenzione ai poveri ed alla revisione del diritto sancito dalla Costituzione americana di possedere armi, anche da guerra o d'assalto. Nel lungo articolo che riassume un po' di seguito, CNN affronta per punti salienti (in inglese) il discorso di Obama. Gergen: Obama 2.0 -- tougher, wiser? Qui c'è una bella galleria di immagini da The Atlantic. Obama's signature achievements, including major reforms of the health care industry and Wall Street, became symbols of political division, with opponents constantly accusing him of hindering needed economic recovery. For his second term, Obama has vowed to press for an overhaul of the nation's immigration policies and new ways to boost the sputtering economy, proposals that are bound to spark battles with his Republican rivals, and oversee the implementation of Obamacare. CNN polling released Sunday showed a majority of Americans -- 54% -- believe Obama will be an outstanding or above average president in his second term, while 43% said he'd be poor or below average. And while overall, seven in 10 Americans hope the president's policies succeed, only four in 10 Republicans feel that way, with 52% hoping that Obama will fail. But House Majority Leader Eric Cantor, R-Virginia, told CNN, "Today is the day for all of us in this country to come together." "I think the president did a fine job, certainly, laying out what he would like to see happen as far as the future of the country," Cantor said. "There are areas of disagreement, but there are also some things fundamentally we agree on, and that is this country is one of opportunity. And sort of the way we get there to help everybody, there are some differences. Hopefully, we can bridge those differences." 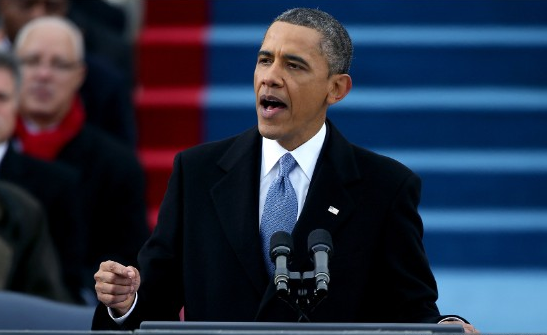 Here you can find the complete speech of the President Obama.